Despite recent progress in malaria control, current estimates of deaths per year from Plasmodium falciparum infection remain unacceptably high (1). The prospects of artemisinin-resistant parasites and pyrethroid-resistant mosquitoes mandate ongoing research into novel cost-effective interventions to control P. falciparum. The RTS,S pre-erythrocytic vaccine has shown only modest levels of efficacy in the target infant population in phase III trials: no other subunit vaccine candidate, however, has achieved a greater level of efficacy, confirming the urgent need for the assessment of novel approaches to malaria vaccination (2). Vaccines targeting the parasite’s asexual blood stage have a long history of success in animal models, but have not yet achieved significant efficacy against a primary endpoint in any phase IIa/b clinical trial (3). One of the central reasons for this is the level of polymorphism in the small group of Ags that have reached field trials. Possible strain-specific efficacy has been reported in phase IIb clinical trials of PfAMA1- and PfMSP2-based vaccines (4, 5). Strain-specific efficacy has also been apparent with PfAMA1 and PfMSP1 vaccines in nonhuman primate models (6, 7). We recently reported that vaccines based upon the Ag reticulocyte-binding protein homolog 5 (PfRH5) were capable of inducing Abs that neutralized multiple laboratory parasite lines, as well as recently culture-adapted field isolates, in the widely used assay of growth-inhibitory activity (GIA) (8–10). Quite unlike previous blood-stage vaccine candidate Ags, PfRH5 does not appear to be a major target of naturally acquired immunity to P. falciparum (8, 11). Moreover, PfRH5 is highly conserved across parasite lines, with only five nonsynonymous single nucleotide polymorphisms identified at frequencies >5% among 227 sequenced field parasite isolates (9, 10). Merozoite invasion of erythrocytes is a complex process involving a series of steps, proceeding through initial binding, reorientation, and committed attachment, followed by moving junction (MJ) motility and vacuole formation (12). Among other functions, proteins on the merozoite surface or secreted from the apical organelles mediate binding to host receptors and/or trigger subsequent steps of invasion through incompletely defined signal transduction mechanisms (13–15). Such proteins are accessible to Ab, which may interfere with these functions and hence inhibit invasion. The interaction of PfRH5 with the erythrocyte surface protein basigin (BSG/CD147) is essential for merozoite invasion into erythrocytes, and blockade of this interaction by mAbs to the BSG host receptor can inhibit invasion (16). Although it is tempting to speculate that the mechanism of action of vaccine-induced anti-PfRH5 Ab may be comparable, previous studies of Abs against other blood-stage P. falciparum Ags have identified rather more complex and mixed mechanisms of action. For example, there appear to be at least three distinct mechanisms of action of Ab against PfMSP1 (17), and although a recent study found that two anti-PfAMA1 mAbs act via blockade of the interaction of PfAMA1 with rhoptry neck protein 2 (18), but additional actions of polyclonal anti-PfAMA1 Abs are likely (19). Although we have shown that Abs against PfRH5 can effectively neutralize parasites, no more detailed description has yet been provided of the mechanism of action of these Abs. In this study, we characterize the effect of polyclonal Abs against PfRH5 and report the development of a panel of mouse mAbs that we describe in detail, including epitope and kinetic analyses. Although we demonstrate that blockade of the PfRH5–BSG interaction by anti-PfRH5 mAbs in vitro consistently results in merozoite neutralization, we report further data suggesting additional actions may contribute to parasite neutralization by anti-PfRH5 Ab. BALB/c mice and New Zealand white rabbits were immunized i.m. with human adenovirus serotype 5 (AdHu5) and modified vaccinia virus Ankara (MVA) viral vectors at an 8- to 17-wk interval, expressing full-length PfRH5 (3D7 allele); a PfRH5 fragment (aa 191–359, NSIY…IRYH); a biallelic PfAMA1 insert; or no malaria Ag, as previously described (8). The latter control immunizations of mice used viruses expressing OVA (20), whereas rabbits were immunized with viruses lacking an Ag insert (8). Sera were collected 14 d after the poxvirus booster immunization. Antisera against PfRH2a/b, PfRH4, and PfRipr for use in the indirect immunofluorescence assays (IFA) were raised as follows. AdHu5 and MVA vaccines were generated, as previously described, encoding a sequence shared between PfRH2a and PfRH2b and previously termed PfRH2A9 (8), or encoding the sequence aa 1329–1607, 28–766, PSKE…MQNI of PfRH4 from the 3D7 clone (NCBI XM_001351509) (21). BALB/c mice were immunized i.m. with 1010 viral particles (vp) AdHu5 diluted in endotoxin-free PBS (50 μL total; 25 μL per ear) on day 0 and boosted i.m. with 107 PFU MVA encoding the same Ag on day 56. Serum was harvested by cardiac bleed 2 wk later. For PfRipr, a recombinant tet-repressed AdHu5 vaccine was generated, as previously described (8), and a recombinant chimpanzee adenovirus serotype 63 (ChAd63) vaccine was generated in the same manner, except the final cloning step involved recombination of the Ag into the ChAd63 genome (22). Viruses were produced in Trex293 cells (8) and purified, as previously described (23). The transgene in both viruses encoded aa 21–1086 of PfRipr from the 3D7 clone (DLIE...SNQN; PlasmoDB PF3D7_0323400). BALB/c mice were immunized i.m. with 1010 vp AdHu5-PfRipr on day 0 and boosted i.m. with 1010 vp ChAd63-PfRipr on day 56, according to previously established immunization regimes for use of heterologous adenoviral vaccines (24). Serum was harvested by cardiac bleed 2 wk later. All animal work was approved by the University of Oxford Animal Care and Ethical Review Committee (in its review of the application for the U.K. Home Office Project License PPL 30/2414 and PPL 30/2889). 3D7 and FVO P. falciparum in vitro parasite maintenance, synchronization, and assays of GIA (with the exception of those depicted in Fig. 4B) were performed, as previously reported (9). For the experiment depicted in Fig. 4B (invasion inhibition with anti-BSG mAbs), a flow cytometry–based assay was employed, as described previously (16), with the exception that parasites were detected using 1:5,000 SYBR Green I (Invitrogen). SYBR Green I–stained samples were excited at 488 nm on a BD FACSCalibur flow cytometer (BD Biosciences) and detected with a 530/30 filter. BD FACS Diva software (BD Biosciences) was used to analyze 50,000 events for each sample. Forward and side light scatter voltages of 423 and 198, respectively, and a threshold of 2,000 on forward light scatter were applied to gate the erythrocyte population. The data collected were further analyzed with FlowJo (Tree Star). Free merozoite preparation was performed as described elsewhere (12, 25). For merozoite attachment assays, merozoites isolated by filter disruption of purified E64-treated schizonts were incubated in the presence of 1 μM cytochalasin D and 10 mg/ml protein G–purified total rabbit IgG for 3 min on a plate shaker, before addition of fresh, uninfected erythrocytes for an additional 10 min. The cells were then washed with RPMI 1640 medium, fixed with methanol, and stained with Giemsa. At least 2000 erythrocytes per experiment were counted manually to enumerate the percentage of erythrocytes with attached merozoites. For IFA in Fig. 1A and Supplemental Fig. 2, 3D7 clone P. falciparum late-stage schizonts and free merozoites were purified by 70% v/v Percoll centrifugation, smeared onto glass slides, dried, and fixed in 4% paraformaldehyde for 30 min, followed by permeabilization with 0.1% Triton X-100 in PBS for 10 min. When treated with E64, this was done as described previously (12, 25). After overnight blocking in 3% BSA in PBS, slides were incubated with primary Abs at room temperature (RT) for 1 h, followed by washing in PBS for 30 min and incubation with secondary Alexa Fluor (488 and 594)–labeled Abs at 1:5000 for 1 h. Nuclei were stained with DAPI at 0.1 μg/ml for 1 h. Slides were finally mounted in Vectashield and viewed on a Zeiss Axioplan 2 imaging system with Plan Apochromat 100×/1.4 oil immersion objective. Images were captured using Axiovision 4.6.3 software and edited using Adobe Photoshop. In Fig. 1A, anti–rhoptry-associated protein 1 (PfRAP1) mouse mAb 7H8/50 was used at 1:200 (26); polyclonal rat anti-PfEBA175 region VI (PfEBA175_RVI) was obtained from MR4 and used at 1:500 (data not shown); anti-PfRON4 mouse mAb 24C6 (27) (a gift of Jean-Francois Dubremetz, Universite de Montpellier 2, Montpellier, France) was used at 1:1000; mouse anti-PfAMA1 (a gift of C. Collins, National Institute for Medical Research) was used at 1:100 dilution; polyclonal mouse anti-PfRH4, anti-PfRH2a/b (data not shown), and anti-PfRipr were used at 1:100, 1:300, and 1:50 dilution, respectively, and were obtained as described above; and purified polyclonal anti-PfRH5 rabbit IgG (20 mg/ml) was used at 1:8000. In Supplemental Fig. 2, polyclonal anti-PfAMA1 rabbit serum (28) (a gift of Alan Thomas, Biomedical Primate Research Centre, Rijswijk, The Netherlands) was used at 1:2000; polyclonal anti-PfRhopH2 rabbit serum (29) was used at 1:4000; polyclonal anti-PfRON12 rabbit serum (30) was used at 1:5000; and anti-PfRH5 mAb 9AD4 was used at 10 μg/ml. For IFA of free fixed merozoites (Fig. 1B), these were isolated as described for the attachment assay, washed in RPMI 1640, and then settled onto glass slides, before fixing in 4% paraformaldehyde in PBS. Triton X-100 (0.1%) in PBS was used to permeabilize the parasites (if stated), before blocking the slides for 90 min at RT with 3% BSA in PBS. Primary Abs were applied for 1 h at RT and included anti-PfRH5 or anti-PfAMA1 (biallelic) purified polyclonal rabbit IgG (20 mg/ml stock solution diluted 1:200 and 1:1000, respectively, in blocking solution). After washing in PBS, secondary goat anti-rabbit Alexa Fluor 488 diluted 1:500 in blocking solution was applied for 1 h at RT. Slides were washed again in PBS and then mounted in Vectashield mounting medium with DAPI (Vector Labs) before viewing under a Leica DMI3000 microscope. For IFA of free nonfixed merozoites (Fig. 1C), these were isolated as described for the attachment assay, incubated in the presence of RBC and 1 μM cytochalasin D for 10 min at 37°C with shaking. Cells were collected by centrifugation at 1800 × g for 5 min and then blocked in 3% BSA in PBS for 10 min. Primary Ab diluted in blocking solution (polyclonal rabbit anti-PfRH5 at 1:2000 or polyclonal rabbit anti-PfAMA1 at 1:1000) was added for 15 min at RT before addition of Alexa Fluor 488–labeled secondary Ab (1:5000) and DAPI diluted in blocking solution (0.1 μg/ml) for 30 min at RT. Parasites were collected by centrifugation and washed in 3% BSA in PBS. Imaging of surface-labeled parasites was taken immediately as for Fig. 1A, except no Vectashield was used. Positive [anti-PfMSP2 mAb 113.1 (31)] and negative control Abs [rabbit polyclonal anti-P. falciparum myosin A tail domain-interacting protein (32)] were included in every experiment (data not shown). For IFA of fixed and permeabilized merozoites (Fig. 1D), these were isolated as described for the attachment assay, incubated in the presence of RBC and 1 μM cytochalasin D for 10 min at 37°C with shaking. Following attachment, the cells were smeared onto glass slides, dried, and fixed using 4% paraformaldehyde for 30 min, followed by permeabilization with 0.1% Triton X-100 for 10 min. Slides were blocked overnight in 3% BSA in PBS. Incubation with primary Abs (polyclonal rabbit anti-PfRH5 at 1:5000; anti-PfRON4 mouse mAb 24C6 at 1:1000; polyclonal mouse anti-PfRipr at 1:50; anti-PfRAP1 mouse mAb 7H8/50 at 1:800) for a duration of 1 h at RT was followed by extensive washes, incubation with AlexaFluor-labeled secondary Abs at 1:5000, and DAPI at 0.1 μg/ml. Slides were mounted in Vectashield and viewed on a Zeiss Axioplan 2 imaging system with Plan Apochromat 100×/1.4 oil immersion objective. mAbs against PfRH5 were raised by vaccinating BALB/c mice with the AdHu5-MVA vaccines encoding full-length PfRH5, as above, but with an 8-wk prime-boost interval. Spleens were harvested 3 d after the MVA boost. Splenocytes from one mouse were fused with Sp2/0 myeloma cells (European Cell Culture Collection, Health Protection Agency, Salisbury, U.K.), and plated in semisolid methylcellulose-based medium (ClonacellHY; Stemcell Technologies) in accordance with the manufacturer's instructions. Two successive rounds of limiting dilution cloning were performed to select hybridomas that secreted IgG capable of binding mammalian cell–expressed recombinant PfRH5 (16) by ELISA (performed as described previously for rabbit anti-PfRH5 ELISA, with the exception that an alkaline phosphatase–conjugated goat anti-mouse IgG secondary Ab [Sigma-Aldrich] was used) (8). A second set of mAbs was generated using the proprietary Direct Selection of Hybridomas system (Abeome) (33). Briefly, splenocytes were fused with Sp2ab cells and immediately subcultured into nine 25-cm2 tissue culture flasks. After 7 d, the resulting BCR-overexpressing cells were stained with enzymatically monobiotinylated PfRH5 produced in HEK293E cells (16), streptavidin-PE, and goat anti-mouse IgG allophycocyanin (both from Invitrogen). Cells staining positively with both fluorophores were selected and deposited singly into medium in 96-well plates by a MoFlo cytometer with CyClone module (Beckman Coulter) (Supplemental Fig. 1A). Following culture to expand cells and ELISA screening (as above), one ELISA-positive clone originating from each subculture flask was selected for further study. Selected hybridomas were grown in medium with ultra-low Ig FCS (Life Technologies), using CellLine1000 two-compartment bioreactors for larger preparations (Integra Biosciences). mAb was purified from supernatant by affinity chromatography using protein G (Pierce). IgG isotypes of the selected mAbs were defined by ELISA, with preadsorption of purified mAb onto Maxi-Sorp plates (Nunc), followed by detection using biotinylated mouse isotype-specific Abs (eBioscience) and alkaline phosphatase–conjugated streptavidin (Sigma-Aldrich). Proteins from 1 × 106 late-stage purified schizonts or uninfected erythrocytes solubilized in Laemmli sample buffers (reducing and nonreducing) were separated by SDS-PAGE on precast NuPAGE polyacrylamide gels (Invitrogen). Proteins were transferred to Protran nitrocellulose membrane, blocked overnight in 5% skimmed milk in PBS/Tween 20, and incubated with rabbit anti-PfRH5 (full-length) polyclonal Ab at 1:10,000 or anti-PfRH5 mAb at 1:200 (QA5, 9AD4, 2AC7, RB3) for 1 h. Detection was carried out by incubation with HRP-conjugated secondary Abs (Bio-Rad Laboratories), followed by visualization with ECL Western blotting detection reagents (GE Healthcare). Avidity-based extracellular interaction screen (AVEXIS) was performed using plate-captured biotinylated recombinant PfRH5 and pentameric β-lactamase–conjugated BSG (BSG-S, the short isoform that predominates on erythrocytes), in accordance with a previously published method (16, 34), with the exception that, between capture of the PfRH5 bait protein on the plate and the application of the BSG prey, a sample of serum or mAb diluted in PBS was applied for 1 h, followed by six washes with PBS. The assay was also performed in the reverse orientation using plate-captured biotinylated BSG and pentameric β-lactamase–conjugated PfRH5; in this case, Ab was preincubated with the PfRH5 for 90 min at RT prior to application to the plate. Where ELISA was performed for comparison with AVEXIS, the method was as described above. Blockade of the PfRH5–BSG interaction by anti-BSG mAbs was also tested by AVEXIS. Abs were obtained from the following sources: P2C2-1-D11 (Advanced Targeting Systems), 8J251 (Lifespan Biosciences), MEM-M6/1 (Abcam), MEM-M6/6 (AbD Serotec), and TRA-1-85 (R&D Systems). Briefly, β-lactamase–tagged BSG prey pentamers were incubated for 1 h at RT with serial dilutions of anti-BSG mAbs prior to presentation to monobiotinylated PfRH5 baits immobilized on a streptavidin-coated plate and development of the assay, as described previously (16). Biotinylated peptides were synthesized by Mimotopes. Peptides were resuspended in DMSO at 50 mg/ml and diluted in PBS to a working concentration of 10 μg/ml; 50 μL of this solution was applied to streptavidin-coated plates, and ELISA was performed, as above, using 50 μL samples of mAb at 5 μg/ml. Initial mapping used a set of 20-mer peptides based upon the 3D7 PfRH5 sequence (running from amino acid residue E26 to Q526), each offset by 8 aa from the previous peptide (i.e., overlapping by 12 aa). For each mAb, responses in excess of the mean OD405 + 3 SDs (across all tested peptides) were regarded as positive. Subsequent mapping of minimal linear epitopes for mAbs QA5 and 9AD4 used peptides progressively truncated from each terminus of the 20 mer recognized by each mAb. Finally, ELISA was performed using a third set of peptides based upon the minimal linear epitopes but each with 1 aa mutated to alanine (or glycine, where the original aa was alanine). Surface plasmon resonance (SPR) measurements were made using a Biacore T100 machine, using T100 version 2 control and evaluation software (all from GE Lifesciences, Amersham, U.K.). All experiments were conducted at an analysis temperature of 37°C. Running buffer comprising 10 mM HEPES, 150 mM sodium chloride, 3 mM EDTA, and 0.05% polysorbate (HBS-EP+) was prepared and adjusted to pH 7.4. Sandwich-binding assays to assess overlap of mAb epitopes were performed using a CM5 chip and mouse Ab capture kit (both from GE Lifesciences). The assay configuration is illustrated in Supplemental Fig. 3A; throughout, the first (primary, or capture) mAb applied is referred to as mAb A, whereas the secondary mAb is described as mAb B. All injections were at 5 μL/min. Both flow cells were covalently coated with anti-mouse IgG capture reagent. First, mAb A was injected at 40 μg/ml for 150 s. A second injection of 250 μg/ml polyclonal protein G–purified IgG from a vaccine-naive mouse was injected across both flow cells for 120 s, to block further capture of Ab by the anti-mouse IgG capture reagent. Third, an injection of 10 μg/ml PfRH5 protein was applied to the active flow cell only for 120 s. Fourth, a repeat injection of mAb A at 40 μg/ml over both flow cells was applied for 40 s, to confirm whether any further PfRH5-specific binding of this mAb could be detected (no binding would be expected onto monomeric protein captured by the same mAb). Finally, an injection of mAb B at 40 μg/ml over both flow cells was applied for 60 s: binding of mAb B to the active flow cell in excess of that to the reference cell thus represented PfRH5-specific binding, indicating that the epitopes of mAb A and mAb B did not overlap. To assess binding inhibition, levels of binding were compared with an estimated level of noninhibited binding for that Ab pairing, defined as the lesser of either the maximum level of binding of that same secondary Ab to PfRH5 captured by any primary mAb, or the maximum level of binding of any secondary Ab to PfRH5 captured by the same primary mAb. Complete inhibition of binding was defined as the absence of any PfRH5-specific binding, partial inhibition as PfRH5-specific binding of <30% of the noninhibited level, and noninhibited binding as ≥30% of the noninhibited level. Further experiments to assess mAb epitope overlap using a nonsandwich competition-binding assay employed a biotin capture (CAP) chip. The assay configuration is illustrated in Supplemental Fig. 4A. The biotin CAPture reagent supplied with the CAP chip was diluted 6-fold in HBS-EP+. In line with the manufacturer's recommendations, the HBS-EP+ running buffer was modified to reduce nonspecific binding by the addition of 1 mg/ml salmon DNA (Sigma-Aldrich) and 2 mg/ml carboxymethyl-dextran (Sigma-Aldrich). PfRH5 protein (enzymatically monobiotinylated at the C terminus) was produced by transient transfection of HEK293E cells, as previously described (16), and extensively dialyzed against PBS to remove free biotin. All injections were at 5 μL/min. Initially, 170 RU PfRH5 was captured. Secondly, either buffer or primary mAb (mAb A, 20 μg/ml) was applied for 600 s, achieving saturation binding where mAbs were applied. A third and final injection of either buffer or a second mAb (mAb B, also at 20 μg/ml and 5 μL/min) was then applied for 180 s. PfRH5-specific binding of mAb B was calculated by double subtraction of the binding of Ab to a reference flow cell coated only with the biotin capture reagent and the change in reference-subtracted binding when the second injection comprised buffer. PfRH5-specific binding of mAb B following a preceding primary mAb A was then compared with a maximum noninhibited level of binding (the level of binding of mAb B when the preceding injection comprised only buffer). A Biacore T100 machine, software, and HBS-EP+ buffer were used, as above. Experiments were conducted at an analysis temperature of 37°C. Single-cycle kinetic measurements of mAb–PfRH5 interactions were performed using a CM5 chip and mouse Ab capture kit (both from GE Lifesciences). Levels of Ab capture were 100–150 resonance units, consistent with those recommended by the manufacturer for a 150-kDa bivalent ligand and 80-kDa analyte. PfRH5 protein was produced with C-terminal rat CD4d3+4 and His6 tags and purified, as previously described (16). Five-fold increasing concentrations of PfRH5 from 0.1 to 62.5 nM were successively injected over the chip for 240 s each at a flow rate of 30 μL/min, followed by a final 1800-s dissociation phase. Double referencing was performed by subtraction of responses on the non–Ab-coated flow cell and responses after injection of buffer. A 1:1 binding model was fitted, with the bulk-shift correction fixed at zero, in accordance with the observed lack of step change in the sensorgrams during injection. Replicate measurements were made in separate experiments, using independently prepared PfRH5 dilution series and Ab-coated chip surfaces. Multicycle kinetic measurements were used to compare the kinetics of PfRH5 interaction with Fab and intact mAb samples used in GIA. These experiments used the biotin CAP chip and HBS-EP+/dextran/DNA buffer described above. The 50 resonance units of fresh PfRH5 protein was captured prior to each application of Ab. Three to five serially diluted samples of each Ab or Fab were prepared; binding of each sample was measured during a 120-s association phase and 800-s dissociation phase. A bivalent analyte-binding model was fitted globally for intact IgG samples; a 1:1 binding model was fitted globally for Fab samples. Calibration-free concentration analysis of the concentration of PfRH5-binding mAb and Fab in the samples used for the assays of GIA was performed, as described elsewhere (9). Fab fragments were prepared using immobilized papain for murine IgG2a (mAbs 9AD4 and RB3) and polyclonal rabbit IgG and immobilized ficin for murine IgG1 (mAbs QA5, 2AC7, and isotype control IgG1 [eBioscience; clone P3.6.2.8.1]), following the manufacturer's protocols (both from Pierce). Undigested IgG and Fc fragments were removed by binding to protein A agarose (Pierce), followed by buffer exchange into incomplete P. falciparum culture medium (for GIA) or PBS (for SPR) using Amicon centrifugal concentrators (Millipore). Primary quantification was performed by A280 measurement (Nanodrop), with confirmatory calibration-free concentration analysis (see above). Proteins that mediate interactions with the host erythrocyte are either constitutively located on the merozoite surface or released during invasion in an ordered schedule from apically located organelles such as the micronemes and rhoptries. IFA images have previously located PfRH5 at the apical end of the merozoite, possibly within the rhoptry body (35–37). Some immunoelectron microscopy (IEM) images have also suggested that PfRH5 may be located in the rhoptry body in late schizonts and on the surface of free merozoites (36, 38). PfRH5 has also been shown to colocalize with the PfRH5-interacting protein (PfRipr) in merozoites, as well as with markers of the MJ in merozoites arrested during RBC invasion (36, 38). In this study, we initially assessed PfRH5 localization by IFA. We observed that polyclonal anti-PfRH5 rabbit Abs (8) do not colocalize with conventional markers of the rhoptry bulb, rhoptry neck, or micronemes (PfRAP1, PfRON4, and PfAMA1, respectively) in permeabilized schizonts or free merozoites of 3D7 clone P. falciparum parasites (Fig. 1A). Similar results were observed with an alternative microneme marker, erythrocyte-binding Ag 175 kDa (PfEBA175) (data not shown). We noted minimal colocalization in schizonts with PfRH2a/b (data not shown) and also with PfRH4, described as a marker of the rhoptry tip (39), but significant colocalization with PfRipr in merozoites and late-stage schizonts, especially following treatment with the cysteine protease inhibitor E64, which prevents merozoite release by inhibiting schizont rupture (40). Localization of PfRH5 by indirect IFA. Localization of PfRH5 was assessed by indirect IFA using anti-PfRH5 polyclonal rabbit serum (green). (A) Fixed and permeabilized schizonts with (+) or without (−) E64 treatment or free merozoites (inset) of 3D7 clone P. falciparum were costained with mouse Abs (red) to mark various organelles: PfAMA1 polyclonal (microneme), PfRAP1 mAb (rhoptry body), or PfRON4 mAb (rhoptry neck); or polyclonal mouse serum against further Ags: PfRH4 and PfRipr. Figures show the merge of the dual staining Abs and nuclei stained with DAPI (blue), as well as the brightfield view. Scale bars, 1 μm. (B) Localization of PfRH5 and PfAMA1 was assessed by indirect IFA using Ag-specific polyclonal rabbit serum (green) on the surface of free, fixed merozoites isolated from E64-treated schizonts either permeabilized with Triton X-100 (+TX100) or nonpermeabilized (−TX100). Nuclei were stained with DAPI, and the merge of the images is shown. Original magnification ×1000. (C) Localization of PfRH5 and PfAMA1 using Ag-specific polyclonal rabbit serum (green) on the surface of nonfixed, nonpermeabilized merozoites adherent to RBC in the presence of 1 μM cytochalasin D. Scale bars, 1 μm. (D) Localization of PfRH5 was assessed by indirect IFA using PfRH5-specific polyclonal rabbit serum (green) on fixed and permeabilized merozoites adherent to RBC in the presence of 1 μM cytochalasin D. Costaining with mouse Abs (red) was used to identify PfRON4, PfRipr, and PfRAP1. Nuclei were stained with DAPI, and the merge of the images together with the brightfield view is shown. RBCs, although present, are only detected as faint membrane structures due to the loss of hemoglobin during paraformaldehyde fixation and Triton X-100 permeabilization. Scale bars, 1 um. Using the same polyclonal rabbit Ab, we also observed that PfRH5 does not appear to be accessible on the surface of free merozoites isolated from E64-treated schizonts in incomplete culture medium. In contrast to the result with anti-PfAMA1 polyclonal rabbit Abs, no detectable staining was observed when anti-PfRH5 Abs were applied to fixed free merozoites without prior permeabilization (Fig. 1B). We were also unable to detect PfRH5 in preparations of unfixed and unpermeabilized merozoites isolated from E64-treated schizonts and adherent to RBCs but with invasion arrested by cytochalasin D treatment (Fig. 1C). Similar experiments performed using merozoites cytochalasin arrested during RBC invasion, followed by fixation and permeabilization, showed PfRH5 close to the PfRON4 marker of the MJ (Fig. 1D), as previously noted in a similar study (36). PfRH5 also colocalized with PfRipr and, in agreement with a previous report (12), release of PfRAP1 through the MJ was observed. Although PfRH5 was not detected on the surface of either free merozoites isolated from in vitro culture or merozoites, which had already reoriented and committed to RBC attachment, it has previously been shown that inhibition of the function of PfRH family members and related proteins can impair merozoite-committed attachment and subsequent formation of the MJ. For example, PfRH4-null W2mef P. falciparum parasites form few MJs when in contact with neuraminidase-treated erythrocytes (12), and Abs to PfRipr are also reported to inhibit attachment of merozoites to erythrocytes (38). These reports suggest that PfRH5 may be released to the merozoite surface at a stage upstream of MJ formation. To further clarify the stage of the invasion process inhibited by polyclonal anti-PfRH5 rabbit Abs, we performed similar inhibition of merozoite attachment assays. These assays demonstrated that anti-PfRH5 purified IgG could markedly reduce attachment of merozoites to erythrocytes (Fig. 2A). Inhibition of merozoite attachment and effect of anti-PfRH5 Abs on the PfRH5–BSG interaction measured by AVEXIS. (A) Three independent assays of merozoite attachment to erythrocytes were conducted. Lines link each observation of the percentage of RBCs with attached merozoites (left axis) from a single assay in the presence of 10 mg/ml purified IgG pooled from rabbits immunized with a nonmalaria Ag (Control), and in the presence of 10 mg/ml purified IgG that was pooled from three representative PfRH5–immunized rabbits (Anti-PfRH5). Right-hand column indicates the percentage reduction in attachment induced by anti-PfRH5 IgG (calculated from the same data; right axis). (B and C) An AVEXIS assay was performed with plate-bound PfRH5 protein and soluble pentameric BSG. Prior to application of BSG, wells were incubated with serial dilutions of antisera from (B) mice or (C) rabbits immunized with viral vector vaccines expressing full-length PfRH5, a previously described PfRH5 fragment, PfAMA1, or a nonmalaria Ag. Points and error bars indicate median and range of three replicate wells. Upper horizontal dashed line indicates the mean − 3 SD of results in control wells with PfRH5, BSG, and substrate, but no Ab. Lower dashed line indicates mean + 3 SD of results in control wells with PfRH5 and substrate, but no BSG. (D) Each subpanel depicts the effect of an individual mAb tested at a range of concentrations by AVEXIS (x-axis). Two subpanels are shown for each mAb, depicting the results obtained with different orientations of the bait and prey proteins used in the assay: the left-hand subpanels show the assay when PfRH5 protein was immobilized to the plate prior to application of soluble pentameric BSG, whereas the right-hand subpanels show data obtained with the reverse orientation. The solid lines (both subpanels, left-hand y-axis) show the OD485 readouts for the AVEXIS assay following preincubation of the PfRH5 protein either on the plate (left-hand panels) or in solution (right-hand panels) with a dilution gradient of each mAb. To permit comparison of the effect in the AVEXIS assay with the level of binding of mAb, total IgG ELISA was also carried out using replicate wells with an identical gradient of concentration of each mAb (broken line, left-hand subpanels, right-hand y-axis). Error bars for each line indicate the mean and range of the OD readings for n = 2–3 replicate wells within an experiment. Having shown that anti-PfRH5 Abs achieved a reduction in attachment of merozoites to erythrocytes, we hypothesized that this activity may be related to the ability of the Abs to block the interaction of PfRH5 with its receptor BSG (16). The interaction can be detected in vitro using recombinantly expressed proteins in the AVEXIS assay (34), enabling us to investigate whether anti-PfRH5 polyclonal Ab was capable of blocking this interaction. We found that polyclonal sera from mice (Fig. 2B) and rabbits (Fig. 2C) vaccinated with the full-length PfRH5 Ag [but not those vaccinated with a previously used fragment of PfRH5 (8, 36), PfAMA1, nor control sera] were capable of complete blockade of this interaction at dilutions up to 1:300 for mouse and 1:900 for rabbit. In light of these results, we continued to investigate whether Abs blocking the PfRH5–BSG interaction were causally responsible for the neutralization of merozoites. We generated two panels of mouse mAbs, totalling eight demonstrably unique mAbs, which were capable of binding PfRH5 as assessed by ELISA (Fig. 2D, broken lines). All mAbs gave strong ELISA readings, except for RB3, which may suggest a low-affinity interaction in this case or the absence of the RB3 epitope from some of the plate-bound protein. Five of the eight hybridomas were generated using a proprietary system that enables flow cytometric sorting of single Ag-specific hybridoma cells (Supplemental Fig. 1A) (33). Basic characteristics of these eight mAbs are summarized in Supplemental Fig. 1B. We initially tested a subset of the mAbs on Western blots of 3D7 P. falciparum schizont lysate (Supplemental Fig. 1C, 1D). Polyclonal anti-PfRH5 rabbit Abs, as well as the mouse mAbs QA5, 9AD4, and RB3 all detected the bands at 63 kDa (full length) and 45 kDa (processing product), previously described by others (35–37). mAb RB3 detected additional bands at ∼28 and 31 kDa, although the 28-kDa band appeared dominant. A band of similar size has also been previously described (37), although these data were inconsistent with the other two reports, and in this published study the 45-kDa product was not detected. One of the mAbs, 9AD4, which stained parasites by IFA, was also selected to further explore Ag localization, in addition to the work previously performed with polyclonal sera. The staining pattern of mAb 9AD4 in IFA was in agreement with that of rabbit polyclonal Ab (Supplemental Fig. 2); once again, PfRH5 did not colocalize with polyclonal Ab markers against the rhoptry neck (PfRON12) (30), rhoptry body (high m.w. complex rhoptry protein 2, PfRhopH2), or micronemes (PfAMA1). We proceeded to test the ability of the mAbs to block the interaction of PfRH5 with BSG by AVEXIS assay (Fig. 2D, solid lines). The assay was performed in two orientations: with plate-captured (immobilized) PfRH5 and soluble pentameric BSG, and vice versa. 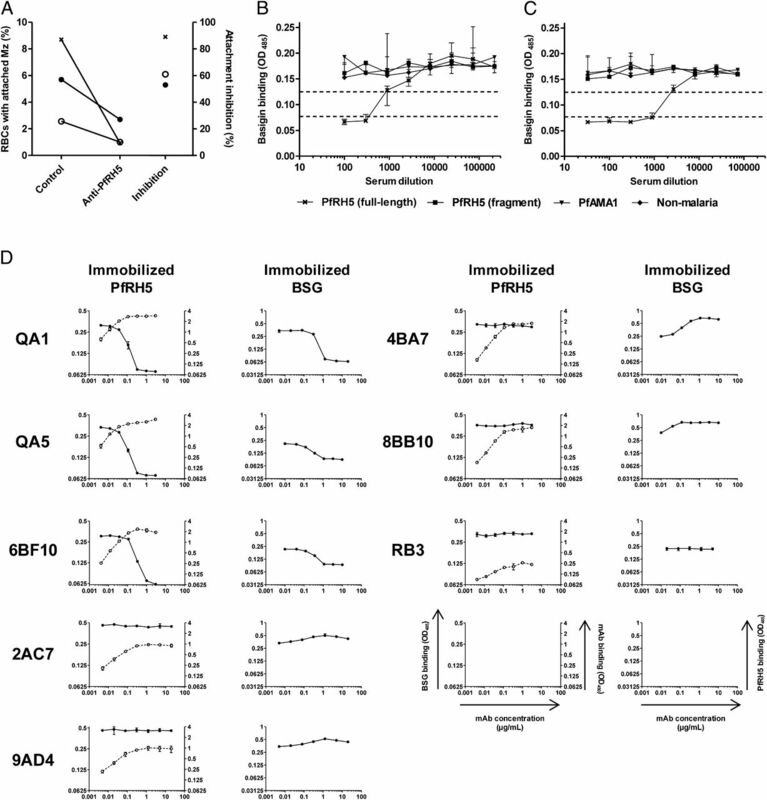 Preincubation of immobilized PfRH5 protein with mAbs QA1, QA5, and 6BF10 blocked the PfRH5–BSG interaction (irrespective of assay reagent orientation), whereas mAbs 4BA7, 8BB10, RB3, 2AC7, and 9AD4 did not inhibit the interaction in either orientation of the assay. Some 2AC7 and 9AD4 preparations did exhibit weak and inconsistent blocking activity at the highest concentrations tested (data not shown). The data shown in Fig. 2D are most representative of the outcome of multiple replicate assays. Having assessed activity of the anti-PfRH5 mAbs in the AVEXIS assay of PfRH5–BSG binding blockade, we next tested the ability of each of the mAbs to neutralize 3D7 clone P. falciparum parasites in a GIA assay. We found that all three mAbs that were capable of blockade of the PfRH5–BSG interaction in the AVEXIS assay (QA1, QA5, and 6BF10) were capable of in vitro parasite neutralization, although with varying levels of potency (achieving 38, 63, and 30% GIA, respectively, at 500 μg/ml) (Fig. 3A). Three of the mAbs that had no effect in the AVEXIS assay (4BA7, 8BB10, and RB3) also neutralized parasites ineffectively, achieving no more than 20% activity in the GIA assay at 500 μg/ml. Interestingly, however, two of the mAbs that did not block in the AVEXIS assay were highly potent in the assay of GIA, with EC50 values of 62 μg/ml (9AD4) and <15 μg/ml (2AC7). Effects of anti-PfRH5 mAbs in the assay of GIA. Anti-PfRH5 mouse mAbs were tested in the in vitro assay of GIA at a range of concentrations against (A) 3D7 clone P. falciparum parasites and (B) FVO parasites. Results show the mean of two experiments with triplicate wells. Error bars indicate interwell SEM. Of 18 laboratory-adapted parasite lines for which the PfRH5 gene has previously been sequenced, FVO is the most divergent from the 3D7 clone upon which our vaccine Ag was based, with the two sequences differing at four amino acid positions (37). 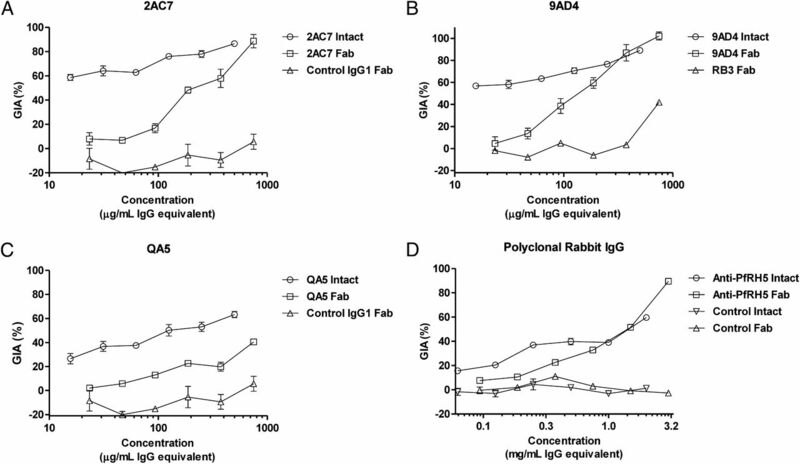 We have previously found that purified polyclonal anti-PfRH5 rabbit IgG raised by the 3D7-based Ag was effective in assays of GIA against FVO parasites (8). However, in light of the possibility that changes to crucially positioned amino acids may affect individual Ab epitopes, we also proceeded to test the anti-PfRH5 mAbs in assays of GIA against FVO parasites. mAbs that neutralized the 3D7 clone also remained effective against FVO, and in fact tended to be more effective against the heterologous strain (Fig. 3B), as we have previously seen with polyclonal anti-PfRH5 rabbit IgG (8). In light of the above results, and given anti-BSG mAbs that block parasite invasion have also been described (16), we sought to investigate whether blockade of the PfRH5–BSG interaction was necessary when targeting the host receptor rather than the parasite adhesin. In a similar manner to 2AC7 and 9AD4, we observed that anti-BSG mAbs that did not block the interaction between the recombinant proteins in the AVEXIS assay (Fig. 4A) could show potent inhibition of invasion (Fig. 4B). Together these data confirmed that evidence of mAb inhibition of the PfRH5–BSG interaction by AVEXIS assay was consistently associated with in vitro GIA, but absence of blockade did not predict absence of GIA activity, suggesting the in vitro binding assay may not fully reflect the dynamics of the in vivo invasion process or that a number of mAbs may function by an alternative mechanism. 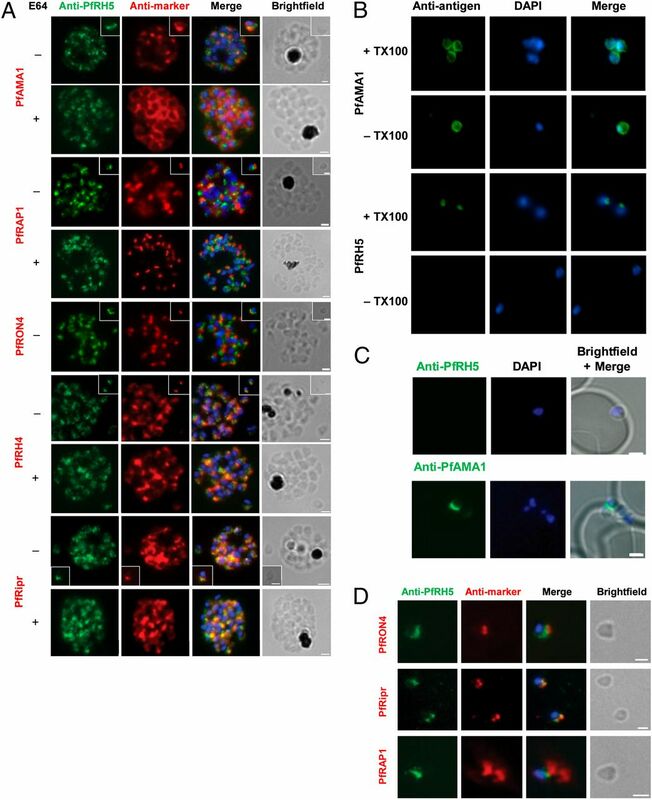 Anti-BSG mAbs that do not block the PfRH5–BSG interaction by AVEXIS are capable of in vitro parasite invasion inhibition. (A) Anti-BSG mAbs were tested for their ability to inhibit the PfRH5–BSG interaction in the AVEXIS assay. mAbs MEM-M6/6 and TRA-1-85 potently blocked the PfRH5–BSG interaction. mAbs P2C2-1-D11, MEM-M6/1, and 8J251 did not. Assays for mAbs MEM-M6/6, TRA-1-85, MEM-M6/1, and 8J251 were performed simultaneously in triplicate; points and error bars indicate median and range of replicate wells. The assay using P2C2-1-D11 was performed separately in singlet. (B) Anti-BSG mAbs were tested at a range of concentrations in a flow cytometric invasion inhibition assay against 3D7 clone parasites. All tested mAbs potently inhibited invasion. Points and error bars indicate median and range of three replicate wells. Data for the BSG–PfRH5 interaction blocking mAbs MEM-M6/6 and TRA-1-85 are in agreement with previously published data (16). To further explore the mechanism of action of anti-PfRH5 Abs, and to shed light upon the regions of PfRH5 required for BSG binding, we attempted to map the binding sites of all eight mAbs using a panel of overlapping 20-mer linear peptides. We successfully mapped the epitopes bound by four of the mAbs. Each of these mAbs bound to a distinct linear epitope (Fig. 5A), either a single peptide or an overlapping pair of peptides. RB3 bound two overlapping peptides, as follows: E50 (EKDDIKNGKDIKKEIDNDKE) and K58 (KDIKKEIDNDKENIKTNNAK). QA5 bound the peptide Y194 (YHKSSTYGKCIAVDAFIKKI), and 4BA7 bound two overlapping peptides, as follows: Y242 (YDINNKNDDSYRYDISEEID) and D250 (DSYRYDISEEIDDKSEETDD). 9AD4 bound the peptide Y346 (YNNNFCNTNGIRYHYDEYIH). Of the four peptide-binding mAbs, QA5 and 9AD4 had been shown to neutralize parasites in the GIA assay. Interestingly, the nonneutralizing mAb 4BA7 bound a peptide in between the linear epitopes of the two neutralizing mAbs, whereas RB3 bound a peptide in the N-terminal region (suggesting the 28-kDa band observed in the Western blot data was probably an N-terminal processing product). Mapping of linear and minimal epitopes for mAb binding. (A) Assessment by ELISA of mAb binding to overlapping PfRH5-derived 20-mer peptides. Binding to native PfRH5 protein is also shown as a control. Peptides are indicated in this graph by the single-letter code and numerical position of their first amino acids, e.g., E26 indicates the peptide ENAIKKTKNQENQLTLLPIK, beginning with glutamic acid 26 (the first amino acid residue after PfRH5′s 25-aa residue signal peptide). *Significant binding (OD405 values >3 SD above the mean for an individual mAb). (B) Binding of mAb QA5 to peptides progressively truncated from the N terminus (white) and the C terminus (red) of its 20-mer epitope (beginning with Y194: YHKSSTYGKCIAVDAFIKKI). Results are the mean of two replicate assays. Truncation of the N terminus beyond Y200 abrogated binding; truncation of the C terminus beyond I213 progressively reduced binding, which was completely abrogated by truncations beyond K211. Binding to a 20 mer with the FVO parasite strain sequence (YHKYSTYGKYIAVDAFIKKI; green) was similar to that to the 3D7-clone 20-mer Y194 (blue). Other controls shown in blue include a nonrecognized 20-mer peptide (beginning with H178) and the 9AD4 20-mer binding peptide (beginning Y346). (C) Binding of 9AD4 to progressively truncated peptides derived from its 20-mer epitope beginning with Y346 (YNNNFCNTNGIRYHYDEYIH), as for (B). (D) Binding of QA5 to peptides with each of the internal amino acids in the sequence YGKCIAVDAFIKK progressively mutated to alanine (or glycine in the case of the two alanines in the native sequence). Results are the mean of two replicate assays. Results obtained with these alanine walk peptides are shown in gray; results with peptides from the N- and C-terminal truncation set are shown in white and red, respectively; results obtained with the originally identified 20-mer peptide are shown in blue. The lettering YGK(C/Y)IAVDAFIKKI indicates the inferred linear epitope for QA5, with sizes of lettering proportional to the reduction in binding resulting from mutation of each amino acid and (C/Y) indicating the polymorphism between 3D7 (red) and FVO (green) parasites. (E) Binding of 9AD4 to the series of alanine walk peptides within the inferred minimal epitope. Colors as in (D); one of the original 20-mer peptides (beginning NGIRY...; bar second from left; blue) was used to infer the role of the initial threonine in the epitope. We continued to define the minimal linear epitopes bound by the two inhibitory mAbs using series of truncated peptides (Fig. 5B, 5C). Interestingly, each of these minimal epitopes contained 1 of the 4 aa that differ between the 3D7 and FVO parasite sequences, but the Abs remained capable of binding to equivalent peptides representing the FVO allele (green bars, Fig. 5B, 5C). To evaluate which amino acids within these minimal peptides were particularly important for Ab binding, we assessed the ability of the mAbs to bind a further series of peptides in which each residue was sequentially mutated to alanine (alanine walking; Fig. 5D, 5E), thus defining the minimal epitopes as shown. The remaining three growth-inhibitory mAbs (QA1, 2AC7, and 6BF10) and the non–growth-inhibitory mAb 8BB10 did not bind to any of the tested peptides (data not shown), suggesting that they recognize conformation-sensitive or discontinuous epitopes. This was consistent with the Western blot data in which 2AC7 failed to bind following SDS-PAGE (unlike the other three mAbs tested by Western, which bind linear peptide epitopes). To localize the binding sites of these mAbs relative to the mapped QA5, 4BA7, and 9AD4 epitopes, and to assess the relationship of the QA5 and 9AD4 epitopes relative to each other on the folded Ag, we performed two SPR assays to assess the ability of pairs of mAbs to bind simultaneously to PfRH5 protein. Initially, a sandwich-configuration assay was used to assess overlap of epitopes bound by the seven mAbs 2AC7, 4BA7, 6BF10, 8BB10, 9AD4, QA1, and QA5 (Fig. 6A, Supplemental Fig. 3). For certain mAb pairs, either complete inhibition of binding of the second mAb or substantially reduced binding was evident. These data were used to construct a network of pairs of mAbs that inhibit each other’s binding (Fig. 6B). For each of the seven mAbs, at least partial inhibition of binding by at least one other mAb was evident. The non–parasite-neutralizing mAb 4BA7 appeared most loosely linked to this network, with its binding not completely inhibited by any other Ab. 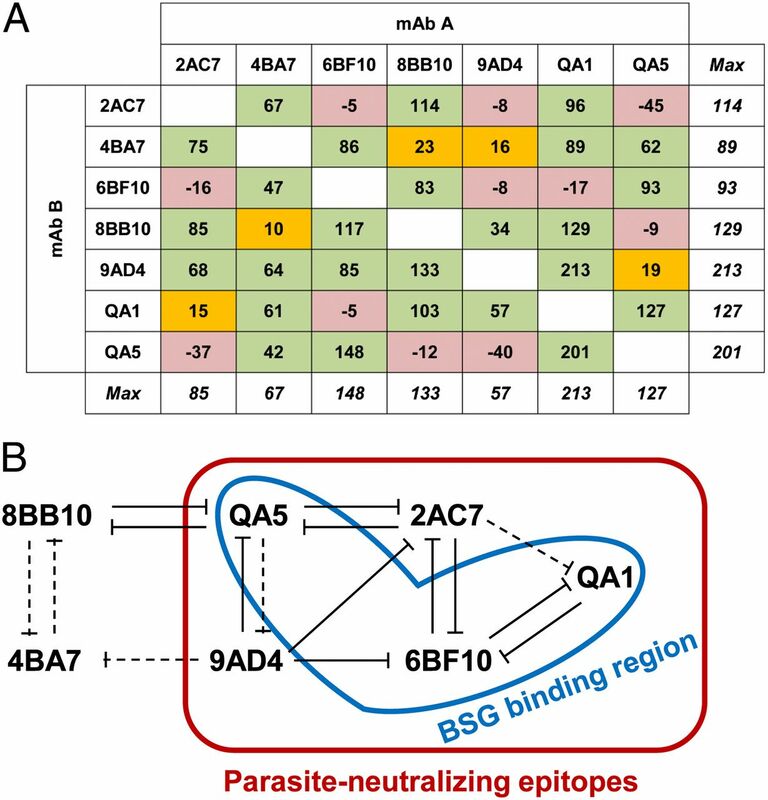 Each of the five parasite-neutralizing mAbs (2AC7, 6BF10, 9AD4, QA1, and QA5) was capable of complete inhibition of the binding of at least one of the others from this group. We next used a second SPR assay, similar to a competition ELISA, to confirm the relationship of the epitopes of five mAbs (2AC7, 4BA7, 9AD4, QA1, and QA5) (Supplemental Fig. 4A–G). The resulting network of pairs of mAbs with competitive binding (Supplemental Fig. 4C) closely resembled that obtained with the sandwich-configuration assay, although some minor differences were observed. Analysis of anti-PfRH5 mAb epitope overlap by sandwich SPR-binding assay. A sandwich SPR-based assay was used to assess overlap of epitopes bound by mAbs 2AC7, 4BA7, 6BF10, 8BB10, 9AD4, QA1, and QA5. (A) Levels of binding (response units) of each mAb when injected as a secondary mAb (mAb B) over PfRH5 captured onto chip by binding to a primary mAb (mAb A). See Supplemental Fig. 3A for illustration of assay configuration, and Supplemental Fig. 3B–H for the data from which these binding levels were calculated. To assess binding competition, levels of binding were compared both with the maximum level of binding of that specific mAb B to PfRH5 captured by any mAb A, and with the maximum level of binding of any mAb B to PfRH5 captured by the same mAb A. Complete competition (red), partial competition (orange), and noncompetitive binding (green) were defined as in Materials and Methods. (B) Schematic model of the arrangement of epitopes on the PfRH5 surface, with summary of inhibitory binding interactions: solid lines indicate complete competition; dashed lines indicate partial competition; absence of a line indicates noncompetitive binding. The blue-outlined area indicates the putative BSG-binding region, as defined by ability of these mAbs to block the PfRH5–BSG interaction in AVEXIS (Fig. 2D); the red-outlined area indicates the region susceptible to neutralizing Abs (Fig. 3). Overall, these results demonstrate that mAbs recognizing at least two distinct regions of the PfRH5 primary sequence are capable of parasite neutralization, but suggest that, in the folded PfRH5 protein, the epitopes of parasite-neutralizing mAbs lie together in a region that overlaps with the region involved in the interaction of PfRH5 with BSG. Although the fine specificities of the neutralizing mAbs QA1, QA5, 2AC7, and 9AD4 are distinguishable, the competition-binding experiment suggested that their epitopes are spatially related. We therefore hypothesized that a factor other than epitope specificity may explain their differing potency in the assay of GIA. Ag–Ab binding kinetics have previously been shown to be important determinants of Ab potency in neutralization of other pathogens (41). We therefore proceeded to examine the kinetics of the interactions between PfRH5 protein and selected mAbs by SPR (Fig. 7). Kinetics of mAb–RH5 interactions. (A–D) Binding data from single-cycle kinetic measurements of the interactions between mAbs 2AC7, 9AD4, QA1, and QA5 are depicted, respectively. Curves represent captured mAb-specific binding of PfRH5 in solution (after subtraction of the PfRH5 binding to the reference cell and refractive index changes due to dummy injections of buffer). In each case, replicate results are shown, obtained on two different days with independently captured mAb chip surfaces (and independently prepared PfRH5 dilution series). Solid lines indicate observed binding; dashed lines indicate model-fitted binding. The maximal level of achievable binding (Rmax) varied between replicates; these differences in Rmax were proportionate to differences in the quantity of captured mAb, which varied between 130 RU and 230 RU for different mAbs and on different days. (E) Results of single-cycle kinetic measurement of interactions of mAbs with PfRH5. To aid interpretation, equilibrium dissociation constants, KD, are shown both in molar units and expressed as the microgram per milliliter concentration of mAb that would be expected to achieve 50% saturation of Ag at equilibrium (assuming monovalent binding; the molar KD multiplied by 1.5 × 108). To aid interpretation of the dissociation rate constant, kd, the interaction t1/2 in minutes is also shown (−ln[0.5]/[60kd]). SEs of model-fitted kinetic parameters and χ2 measures of model goodness-of-fit (<10% of Rmax in all cases) are also presented. The equilibrium dissociation constant, KD, for an Ab–Ag interaction reflects the concentration of Ab required to bind 50% of available Ag at equilibrium. All four mAbs had KD values in the range 0.3–1.4 nM, such that even the lowest concentrations present during the GIA assay (15 μg/ml = 100 nM) would be ∼50-fold in excess of those required to achieve 50% binding at equilibrium. The concentrations of Ab present in the GIA assay would thus be more than sufficient to bind most of the Ag if there was sufficient time available to reach equilibrium. However, the period of extracellular exposure of a merozoite prior to erythrocyte invasion is likely to be brief (∼1 min) (42), and hence it may be more relevant to consider the time taken to reach equilibrium rather than percentage Ag saturation at equilibrium. Interestingly, association rate constants, ka, of the most potent Abs (2AC7 and 9AD4) were relatively high, and substantially higher than the value of 1 × 105 M−1s−1 used to illustrate a previous discussion of the kinetics of merozoite neutralization by Ab (43). 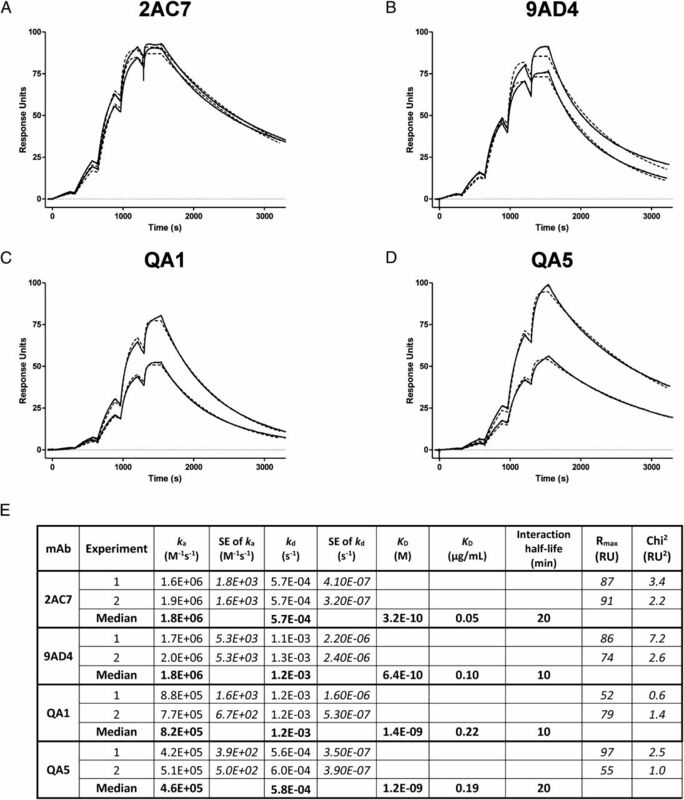 The measured ka values of the two less potent parasite neutralizing mAbs studied (QA1 and QA5) were, respectively, 2- and 4-fold lower than those of 2AC7 and 9AD4. In contrast, the dissociation rate constants for all four mAbs were sufficiently slow to result in interaction t1/2 of 10 min or more, well in excess of the likely period of extracellular exposure of a viable merozoite. Overall, these data suggest that the on-rate of IgG binding, as well as the epitope specificity, may be associated with merozoite neutralization potency. The experiments above focused upon the interactions of PfRH5 with Ab and BSG without addressing the potential contribution to parasite neutralization of the bivalent nature of the IgG molecule and its Fc portion. We therefore aimed to compare the effectiveness of anti-PfRH5 monovalent Fabs and intact IgG in the assay of GIA. Previous studies of Fabs derived from polyclonal Abs and mAbs against PfAMA1 have suggested that these neutralize parasites at least as effectively as intact IgG (19, 44). In contrast, in this study, we observed that anti-PfRH5 Fabs consistently had higher GIA EC50 values than intact IgG (∼10-fold) when the Fabs were derived from the QA5, 2AC7, and 9AD4 mAbs (Fig. 8A–C), although this was not apparent for polyclonal IgG (Fig. 8D). At higher concentrations, Fabs proved just as effective as intact IgG for both polyclonal rabbit anti-PfRH5 IgG and the mAbs. In vitro GIA with anti-PfRH5 Fabs as compared with GIA with intact IgG. GIA was assessed against 3D7 clone. P. falciparum parasites with (A) mAb 2AC7, (B) mAb 9AD4, (C) mAb QA5, and (D) purified polyclonal rabbit anti-PfRH5 IgG. In each case, GIA with intact IgG is plotted as well as GIA with the respective Fabs. GIA using control purified rabbit IgG and control Fab samples is also shown. A control IgG1 mouse mAb was used for 2AC7 and QA5, whereas RB3 (an IgG2a mAb) was used for 9AD4. The RB3 Fab showed negative GIA within the range of concentration (up to 250 μg/ml) in which intact RB3 mAb is GIA negative (Fig. 3). Results show the mean of two assays, each with three replicate wells; error bars plot interwell SEM. Concentrations are shown as IgG equivalent. For Fabs, this is the weight/volume concentration of IgG that would have the same molar concentration of Ag-binding sites (i.e., 1.5× the w/v Fab concentration). Coomassie-stained gels of the Fab preparation were used to demonstrate purity (data not shown). To exclude the possibility that the digestion process had reduced the PfRH5-binding activity of the Fabs, we measured the concentration and affinity of bioactive QA5 and 9AD4 Fabs (i.e., the concentration of Fabs capable of binding PfRH5) and the on-rate of the interaction using SPR multicycle kinetic and calibration-free concentration analyses (9) techniques. The measured values were within 50% of those obtained with comparator samples of intact IgG (data not shown), a difference insufficient to explain the 10-fold discrepancy in the GIA assay mAb results. Neutralization was thus still possible with the Fabs but (especially for the mAbs) tended to be less effective than with intact IgG, suggesting a moderate but nonessential contribution of the Fc to invasion inhibition. PfRH5 is now the leading candidate Ag for inclusion in a next-generation antimerozoite blood-stage malaria vaccine based on potent cross-strain anti-PfRH5 activity in assays of GIA and the knowledge that its interaction with BSG is essential and universally required for erythrocyte invasion (8, 16). Importantly, anti-PfRH5 Ab-mediated GIA has subsequently been shown to be strongly associated with in vivo protection (A. Douglas, G. Wright, and S. Drape, manuscript in preparation). Although we acknowledge the likelihood that other effector mechanisms could contribute to protection induced by other blood-stage Ags, it appears unlikely that PfRH5 (a relatively low-abundance protein with brief exposure on the merozoite surface) is a good target for merozoite-opsonizing Ab. We have therefore continued to focus upon the GIA assay, in the hope that a better understanding of the process by which anti-PfRH5 Abs neutralize P. falciparum could assist in the design of improved strategies to inhibit erythrocyte invasion by the parasite. Previous IFA data for PfRH5 have shown a speckled pattern in schizont stages and an apical localization within merozoites (35–37), whereas IEM data have located the Ag to the rhoptries (35, 36, 38). Our IFA data using both polyclonal anti-PfRH5 rabbit IgG as well as the 9AD4 mAb are in agreement with these studies, and also confirm previous reports that PfRH5 does not colocalize with markers of the micronemes, PfRON markers of the rhoptry neck, or the PfRhopH2 and PfRAP1 markers of the rhoptry bulb (35–37). Limited colocalization of PfRH5 with PfRH2a/b has been reported, but supporting IEM data were not conclusive (36). In this study, we also observed limited colocalization of PfRH5 with other PfRH family members, PfRH4 or PfRH2a/b, in late-stage schizonts. Although not assessed in this work, it also seems unlikely from the staining patterns observed that PfRH5 would localize to other secretory organelles such as the threadlike mononemes (45) or exonemes that are discharged during egress (46). In contrast, PfRH5 was confirmed to colocalize with PfRipr, especially in very late-stage schizonts following E64 treatment, and this was maintained in merozoites arrested during RBC invasion. We remained unable to detect PfRH5 on the merozoite surface in any assay, with staining only successful following permeabilization. The results of our merozoite attachment assay nevertheless do suggest an effect of anti-PfRH5 Ab upon the reorientation of merozoites and/or subsequent MJ formation. Indeed, tight coordination of parasite invasin and adhesin release appears to lead to the presence of these proteins on the surface of the merozoite, “just in time,” prior to, or at the time of invasion (14, 39). Our results therefore suggest that PfRH5 has a subcellular location distinct from well-characterized markers, but that it colocalizes with PfRipr toward the MJ during RBC invasion. The majority of PfRH5 is unlikely to be released to the merozoite surface by exposure to the low K+ extracellular environment, which has previously been shown to result in externalization of the micronemal protein PfEBA175 (15). PfRH5 may therefore only be transiently accessible to Ab after the merozoite contacts the RBC. If this is the case, the time window in which anti-PfRH5 IgG must act to block invasion may be shorter than 30 s; indeed, if the Ab is acting between RBC contact and reorientation or MJ formation, this period may be as short as 11 s (42). Such a brief period of Ag exposure will place substantial kinetic constraints upon the binding of Ab (43), making it all the more surprising that anti-PfRH5 Abs appear to be so effective. We subsequently hypothesized that the invasion-inhibitory effects of anti-PfRH5 IgG may be related to the ability of the Abs to block the interaction of PfRH5 with its receptor BSG. Polyclonal sera against the full-length PfRH5 Ag blocked this interaction in the AVEXIS assay in accordance with its ability to show functional GIA. To address this question further, we raised eight new mouse mAbs against the PfRH5 Ag, and also used a panel of existing anti-BSG mAbs. The novel anti-PfRH5 mAbs included Abs with GIA EC50 values among the lowest of any anti-merozoite Ab described to date, and considerably lower than those of intensively studied anti-PfAMA1 mAbs 4G2 and 1F9 (19, 47). Similar to polyclonal sera, those mAbs that showed effective GIA against vaccine-homologous parasites were also capable of neutralizing a vaccine-heterologous parasite. Consistent with our hypothesis that Abs capable of blocking the PfRH5–BSG interaction in vitro could neutralize parasites, all anti-PfRH5 and anti-BSG mAbs that blocked the PfRH5–BSG interaction in the AVEXIS assay also had some neutralizing effect against parasites. Three anti-PfRH5 mAbs that had no effect on the interaction also had no neutralizing activity, including mAb RB3, whose binding epitope localized to the N terminus of PfRH5, which is known to be cleaved leaving the 45-kDa product. However, although demonstration of blockade in the AVEXIS assay consistently predicted functional GIA, absence of PfRH5–BSG AVEXIS blockade did not predict absence of GIA: the two anti-PfRH5 mAbs that showed the most potent GIA (9AD4 and 2AC7) did not block effectively in AVEXIS, and three anti-BSG mAbs exhibited GIA in the absence of blocking in AVEXIS. We have not yet attempted to identify the mechanism of invasion inhibition by mAbs that do not affect the PfRH5–BSG interaction in AVEXIS. It is possible that the in vitro AVEXIS assay does not reflect the full dynamics of the in vivo PfRH5–BSG interaction in some manner, such that a blocking effect of these mAbs does occur in vivo despite being undetectable by AVEXIS. The extremely high parasite-neutralizing potency of 2AC7 and 9AD4 is, however, intriguing and strongly suggests that these two mAbs are blocking a crucial part of the invasion process. Such Abs may instead be blocking the interaction of PfRH5 with another binding partner (with PfRipr being a prime candidate) or possibly the processing of the PfRH5 protein. Alternatively, this potency may arise not from a specific block of the interaction of PfRH5 with a partner, but instead simply from steric and cross-linking effects of the binding of Abs to critical components of the invasion machinery—spanners in the works—a result supported to some extent by the loss of potency of 2AC7 and 9AD4 Fabs relative to intact IgG. It is also possible that the mechanisms of action of anti-PfRH5 and anti-BSG Abs could be quite different; mAbs against BSG may, for instance, act to block invasion by sequestering or reducing mobility of BSG in the erythrocyte membrane. In vitro assays of the ability of vaccine-induced polyclonal sera to block the interaction of parasite adhesins and their receptors have previously been proposed to be useful readouts of functional Ab induction, and hence potential surrogates of in vivo protection (48). The results presented in this work suggest that, at least for PfRH5, given the possibility of multiple mechanisms of Ab action, it is probably most relevant to study the ability of vaccine-induced Abs to achieve GIA, a functional readout more closely related to the in vivo situation. For other parasite species, notably Plasmodium vivax (for which in vitro neutralization assays remain challenging), receptor–ligand blockade assays will continue to have an important role. We also identified minimal linear epitopes recognized by the growth-inhibitory mAbs QA5 and 9AD4. Interestingly, each of these epitopes contained sequence coded by one of the few known single nucleotide polymorphisms within PfRH5, suggesting these sequences may be under a degree of immune pressure, although each mAb successfully recognized peptides containing the heterologous epitope. This epitope mapping suggests two regions of the PfRH5 primary structure that are likely to be surface exposed, and, at least in the case of the QA5 epitope, likely to be closely related to the BSG binding site. The identification of the nonneutralizing 4BA7 mAb binding site between these two neutralizing sites, combined with competition-binding results demonstrating overlap between the QA5 and 9AD4 epitopes, suggests that the molecule may fold in a manner that brings the QA5 and 9AD4 epitopes together, with a loop of intervening sequence that is not critical to BSG binding nor a target of neutralizing Ab. Our observations of the mAb kinetic data also raise the possibility that binding on-rate may be an important parameter in determining neutralization potency. This seems highly plausible, because parasite neutralization is constrained to occur within a brief window of PfRH5 Ag exposure. It has been suggested in studies of humans vaccinated with tetanus toxoid that maximal on-rates can be reached by vaccination, and that this parameter is not further enhanced by booster vaccinations (49). This toxoid study did not take account of the potential effect of adjuvants upon affinity. It therefore remains unclear whether Ab on-rate is a parameter that the vaccinologist can attempt to influence through vaccine design, such as adjuvant selection. This may well be a question worthy of further investigation. However, whereas mAb on-rates are plausibly related to their neutralization potency, it is arguably less likely that off-rates are relevant. Modern Ab-inducing vaccine platforms are capable of inducing Ag-specific Ab concentrations well in excess of 15 μg/ml (50, 51). It seems unlikely that an antimerozoite vaccine will achieve protection without effective serum IgG concentrations above this level. In the relevant in vivo situation, therefore, Ab concentrations are well in excess of those required to bind the majority of Ag at equilibrium, and the time taken for a merozoite to complete invasion is likely to be far shorter than the dissociation t1/2 of an Ag–Ab complex that has formed (42). The rate at which merozoite invasion is neutralized is therefore most likely determined by the Ab on-rate and concentration, rather than off-rate (43). Although an association between Ab off-rate and risk of disease was recently reported in an immunoepidemiological study of natural immunity to malaria, such evidence is far from establishing a causal link (52). The experiments conducted in this work with anti-PfRH5 Fabs suggested a reduction in the potency of parasite neutralization by Fabs as compared with intact mAb IgG. This contrasts with the effect of digestion of anti-PfAMA1 mAbs upon their neutralizing potency (19, 44) and is suggestive that there is some additional neutralizing action of intact bivalent anti-PfRH5 IgG beyond simple occlusion of the BSG binding site on PfRH5. It is possible that mAb-induced impedance of the movement of PfRH5 molecules relative to each other, and relative to other proteins, may be enhanced by cross-linking of PfRH5 molecules and the presence of the bulkier intact IgG molecule. Despite this potency reduction, it was clear that monovalent binding of anti-PfRH5 Fabs from the mAbs can still achieve high levels of GIA and the effect was minor for polyclonal IgG, an observation consistent with the hypothesis that blockade of the interaction of PfRH5 with its binding partners is a major contributor to parasite neutralization. Overall, our results shed light upon the mechanism of action of anti-PfRH5 Ab. At the level of the whole parasite, it appears that the brevity of the PfRH5 exposure window is likely to necessitate rapid binding of Ab to neutralize parasites. At the level of the PfRH5 molecule, we have demonstrated that Abs that block the PfRH5–BSG interaction show functional GIA; however, other mechanisms may also operate. Neutralizing mAbs bind spatially related epitopes involving at least two defined regions of the PfRH5 primary sequence. These findings offer insights into which approaches may assist design of improved PfRH5 immunogens. The mAbs we have developed and characterized will be valuable tools in future studies of PfRH5 structure, function, and the wider mechanisms of erythrocyte invasion by the P. falciparum merozoite. A.R.W., A.D.D., J.J.I., C.C., L.Y.B., J.C.R., G.J.W., and S.J.D. are named on patent applications relating to PfRH5 and/or other malaria vaccines. R.S. is an employee of Abeome, which has developed and is marketing the Direct Selection of Hybridomas technology for mAb generation. We are grateful for the assistance of Sumi Biswas and Matthew Dicks (Jenner Institute, University of Oxford), David Staunton (Biophysical Instrument Facility, Department of Biochemistry, University of Oxford), and Alfredo Nicosia (Okairòs, Italy) for provision of the ChAd63 vector.
. 2012. Global malaria mortality between 1980 and 2010: a systematic analysis. Lancet 379: 413–431.
. 2013. Malaria vaccine R&D in the decade of vaccines: breakthroughs, challenges and opportunities. Vaccine 31(Suppl. 2): B233–B243.
. 2002. A recombinant blood-stage malaria vaccine reduces Plasmodium falciparum density and exerts selective pressure on parasite populations in a phase 1-2b trial in Papua New Guinea. J. Infect. Dis. 185: 820–827.
. 2008. Protection induced by Plasmodium falciparum MSP1(42) is strain-specific, antigen and adjuvant dependent, and correlates with antibody responses. PLoS One 3: e2830.
. 2011. The blood-stage malaria antigen PfRH5 is susceptible to vaccine-inducible cross-strain neutralizing antibody. Nat. Commun. 2: 601.
. 2012. Enhancing blockade of Plasmodium falciparum erythrocyte invasion: assessing combinations of antibodies against PfRH5 and other merozoite antigens. PLoS Pathog. 8: e1002991.
. 2013. 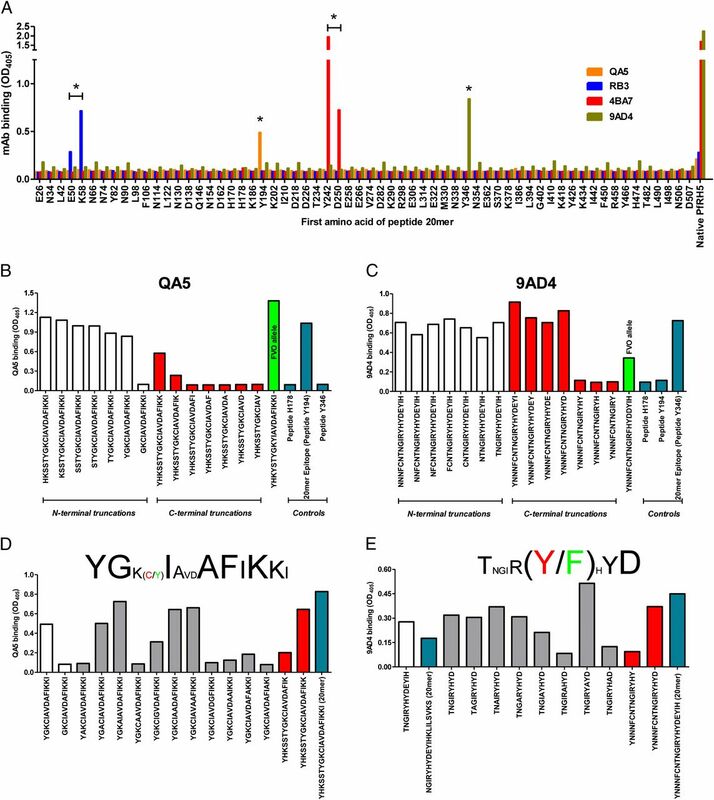 A full-length recombinant Plasmodium falciparum PfRH5 protein induces inhibitory antibodies that are effective across common PfRH5 genetic variants. Vaccine 31: 373–379.
. 2012. Anti-Plasmodium falciparum invasion ligand antibodies in a low malaria transmission region, Loreto, Peru. Malar. J. 11: 361.
. 2011. Super-resolution dissection of coordinated events during malaria parasite invasion of the human erythrocyte. Cell Host Microbe 9: 9–20.
. 2012. Erythrocyte and reticulocyte binding-like proteins of Plasmodium falciparum. Trends Parasitol. 28: 23–30.
. 2012. The cellular and molecular basis for malaria parasite invasion of the human red blood cell. J. Cell Biol. 198: 961–971.
. 2010. Distinct external signals trigger sequential release of apical organelles during erythrocyte invasion by malaria parasites. PLoS Pathog. 6: e1000746.
. 2011. Basigin is a receptor essential for erythrocyte invasion by Plasmodium falciparum. Nature 480: 534–537.
. 2012. Plasmodium falciparum 19-kilodalton merozoite surface protein 1 (MSP1)-specific antibodies that interfere with parasite growth in vitro can inhibit MSP1 processing, merozoite invasion, and intracellular parasite development. Infect. Immun. 80: 1280–1287.
. 2011. Binding of Plasmodium merozoite proteins RON2 and AMA1 triggers commitment to invasion. Proc. Natl. Acad. Sci. USA 108: 13275–13280.
. 2005. Mode of action of invasion-inhibitory antibodies directed against apical membrane antigen 1 of Plasmodium falciparum. Infect. Immun. 73: 2116–2122.
. 2011. The requirement for potent adjuvants to enhance the immunogenicity and protective efficacy of protein vaccines can be overcome by prior immunization with a recombinant adenovirus. J. Immunol. 187: 2602–2616.
. 2002. Gene structure and expression of a Plasmodium falciparum 220-kDa protein homologous to the Plasmodium vivax reticulocyte binding proteins. Mol. Biochem. Parasitol. 121: 275–278.
. 2011. A viral vectored prime-boost immunization regime targeting the malaria Pfs25 antigen induces transmission-blocking activity. PLoS One 6: e29428.
. 2010. Isolation of viable Plasmodium falciparum merozoites to define erythrocyte invasion events and advance vaccine and drug development. Proc. Natl. Acad. Sci. USA 107: 14378–14383.
. 1986. A rhoptry antigen of Plasmodium falciparum contains conserved and variable epitopes recognized by inhibitory monoclonal antibodies. Mol. Biochem. Parasitol. 18: 183–195.
. 1988. Characterization of a 225 kilodalton rhoptry protein of Plasmodium falciparum. Mol. Biochem. Parasitol. 27: 135–141.
. 1985. Isolation of a Plasmodium falciparum rhoptry protein. Mol. Biochem. Parasitol. 14: 293–303. Knuepfer, E., O. Suleyman, A. R. Dluzewski, U. Straschil, A. H. O'Keeffe, S. A. Ogun, J. L. Green, M. Grainger, R. Tewari, and A. A. Holder. 2013. RON12, a novel Plasmodium-specific rhoptry neck protein important for parasite proliferation. Cell. Microbiol. doi:10.1111/cmi.12181.
. 1996. Structural analysis of the glycosyl-phosphatidylinositol membrane anchor of the merozoite surface proteins-1 and -2 of Plasmodium falciparum. Mol. Biochem. Parasitol. 75: 131–143.
. 2008. The motor complex of Plasmodium falciparum: phosphorylation by a calcium-dependent protein kinase. J. Biol. Chem. 283: 30980–30989.
. 2009. Engineered cell surface expression of membrane immunoglobulin as a means to identify monoclonal antibody-secreting hybridomas. J. Immunol. Methods 343: 28–41.
. 2013. Identifying novel Plasmodium falciparum erythrocyte invasion receptors using systematic extracellular protein interaction screens. Cell. Microbiol. 15: 1304–1312.
. 2008. PfRH5: a novel reticulocyte-binding family homolog of Plasmodium falciparum that binds to the erythrocyte, and an investigation of its receptor. PLoS One 3: e3300.
. 2009. Reticulocyte-binding protein homologue 5: an essential adhesin involved in invasion of human erythrocytes by Plasmodium falciparum. Int. J. Parasitol. 39: 371–380.
. 2008. Erythrocyte binding protein PfRH5 polymorphisms determine species-specific pathways of Plasmodium falciparum invasion. Cell Host Microbe 4: 40–51.
. 2011. An EGF-like protein forms a complex with PfRh5 and is required for invasion of human erythrocytes by Plasmodium falciparum. PLoS Pathog. 7: e1002199.
. 2012. Subcompartmentalisation of proteins in the rhoptries correlates with ordered events of erythrocyte invasion by the blood stage malaria parasite. PLoS One 7: e46160.
. 2001. Malaria parasite exit from the host erythrocyte: a two-step process requiring extraerythrocytic proteolysis. Proc. Natl. Acad. Sci. USA 98: 271–276.
. 2009. Lack of antibody affinity maturation due to poor Toll-like receptor stimulation leads to enhanced respiratory syncytial virus disease. Nat. Med. 15: 34–41.
. 2009. Morphology and kinetics of the three distinct phases of red blood cell invasion by Plasmodium falciparum merozoites. Int. J. Parasitol. 39: 91–96. 1987. Kinetic constraints on the development of a malaria vaccine. Parasite Immunol. 9: 1–9.
. 2007. Fine mapping of an epitope recognized by an invasion-inhibitory monoclonal antibody on the malaria vaccine candidate apical membrane antigen 1. J. Biol. Chem. 282: 7431–7441.
. 2007. Mononeme: a new secretory organelle in Plasmodium falciparum merozoites identified by localization of rhomboid-1 protease. Proc. Natl. Acad. Sci. USA 104: 20043–20048.
. 2007. Subcellular discharge of a serine protease mediates release of invasive malaria parasites from host erythrocytes. Cell 131: 1072–1083.
. 2006. 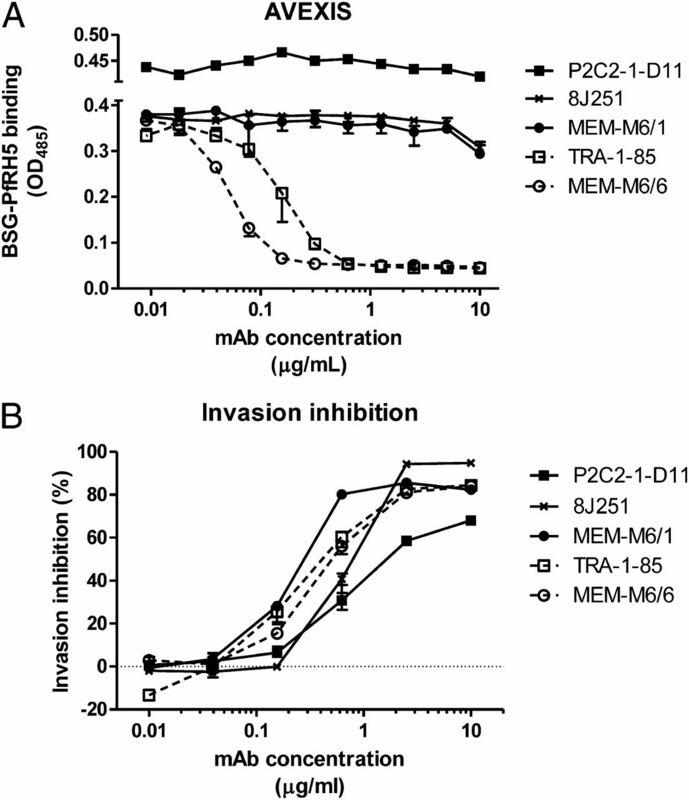 The most polymorphic residue on Plasmodium falciparum apical membrane antigen 1 determines binding of an invasion-inhibitory antibody. Infect. Immun. 74: 2628–2636.
. 2008. Targeting the Plasmodium vivax Duffy-binding protein. Trends Parasitol. 24: 29–34.
. 2011. Limits for antibody affinity maturation and repertoire diversification in hypervaccinated humans. J. Immunol. 187: 4229–4235.
. 2009. Phase 1/2a study of the malaria vaccine candidate apical membrane antigen-1 (AMA-1) administered in adjuvant system AS01B or AS02A. PLoS One 4: e5254.
. 2012. High affinity antibodies to Plasmodium falciparum merozoite antigens are associated with protection from malaria. PLoS One 7: e32242.